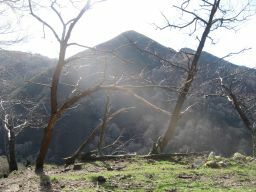 There is a wide range of beautiful hikes around Fontebona. 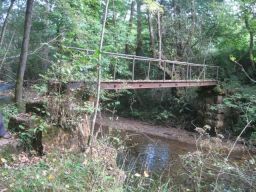 The only "but" is that many old roads and paths have fallen into disuse. 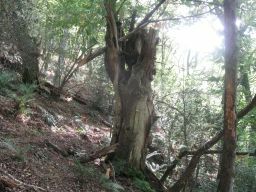 It took many hours of wandering about and retracing our steps to find a good number of paths that are still passable. After about three years of pleasantly roaming about we now have 12 routes worked out varying from 3 to 23 kilometres. For one euro we give you the detailed route description. We have a accompanying general map at the reception which you can study. This tour has been specially designed for our donkey hike and avoids busy traffic, to build up confidence with the donkeys Pili en Lulu. 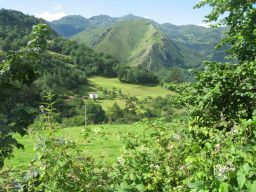 The route leads you through a typical Asturian landscape with alternatively meadows and woodlands, a picturesque village (Lozana) and vistas, wooded banks and stone stables. 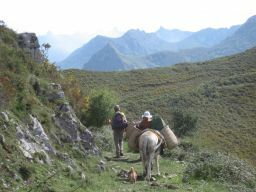 A really nice route, with or without a donkey. This short walk is very woody. A must for lovers of old woods, shade or shelter, but also very interesting if you like mushrooms. It´s not only wood, wood, wood. 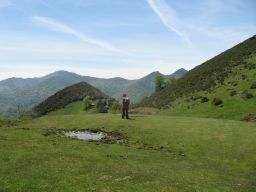 You also walk along meadows, there are beautiful views, and you shortly enter Sammartín, if you want to. At the end you pass (but not through!) the stone quarry La Peridiella. If you bring your dog on this route, do keep him or her on the lead from about la Venta. Dogs literally go for it on this part of the route because of all the smells of game. This short hike brings you via the valley of the river La Marea and through Candanedo to Beloncio, the ancient capital of the Celtic people called Lugones. In the beautiful village of Beloncio, also an important settlement for the Romans, is a bar where you can take a break. Though the cool washing place at the end of this village is very much worth while for taking a break. Fantastic if you, just like the anonymous supporter of this idyllic spot, love flowers and plants ánd gardening. You want to go to Infiesto, and quickly please, but can it also be a pretty route por favor? Then this is the right route. 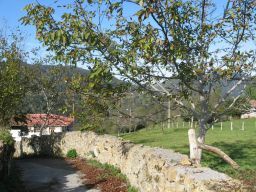 You pass on the high side, via Lozana and the wide views, taking as many quiet country roads as possible to Infiesto. You do take a short detour to the Roman church in San Juan de Berbío. A nice excuse to take the somewhat quieter roads again. 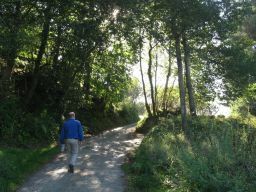 On your way back you follow the path along the river La Marea. 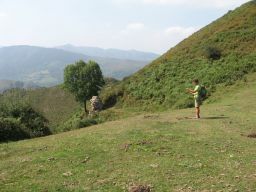 First over the Sellón ridge to the Ermita de San Lozenzo of which only a pile of stones remains. On your way you have splendid views on your left and right. 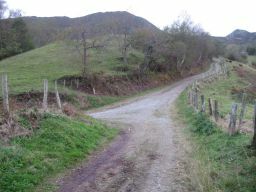 This Ruta del Camín Real del Sellón (14 km) is also to be done with two cars from the Puerto del Arnicio (908m) to Fontebona. 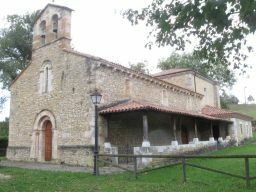 At the Ermita you go down to the village Omedal. And from here to Espinaredo, where you find the biggest assembly of graneries (hórreos) of Asturias. Through a climb to Lozana you get back on Fontebona. Despite a second half with rather many paved roads the route is worth while. This is a short stroll above Fontebona. The round brings you just a bit higher than Fontebona. The walk is a nice choice if you don´t want to walk too long, and yet want to get a good impression of the surrounding area. The walk goes both along meadows as through woods and is partially quite rough. So please do wear clothes with long sleeves. The tour is not very suitable for small children, because there are prickly bushes on a part of the route. In very rainy weather we do not recommend this walk for those without good hiking shoes, because of the muddy parts on some stretches of the route. This daytrip brings you a few times up hill and down dale. You pass a mountain ridge with its beautiful views twice and pass the river La Marea with her own charm twice. On your way you find bars (Vegarrionda, Arenas de Beloncio, Vallín de Beloncio) to take a well deserved break. A short walk with many roundabout ways. Between times you can relax along or take a bath in the river La Marea. First you take many roundabout ways to Pandiella, where you have to do some asphalt, but after that you will walk to Esteli over unpaved roads. In rainy weather it can be a bit muddy on some parts of this route. You will pas a few holes in the landscape, dolines. The church San Juan de Berbío is a nice spot for a break. After that you walk through Santianes over the main road to Otero, where you leave the main road again. From Lozana you take a country track back to Fontebona. This hike is, like route 11, a serious daytrip. Routes 10 and 11 are characterized by very pretty vistas and follow quite long stretches along rivers. Both routes are on the east of Fontebona, but have a different valley as furthest part of the route. Route 10 is, compared to route 11, somewhat rougher. This hike is, like route 10, a serious daytrip. Routes 10 and 11 are characterized by very pretty vistas and follow quite long stretches along rivers. Both routes are on the east of Fontebona, but have a different valley as furthest part of the route. Route 11 is, compared to route 10, somewhat easier. A stiff hike. Because you are an experienced hiker. Because you like to climb that intriguing point southwest of Fontebona. Because you like panoramic views. And because you don´t mind sweating it out. This route description is global, because we did do the hike, without making all the notes. But with our explanation it is well doable. The route is worth it. We at least were very much surprised by the vistas from the Pico Múa: south the Cordillera Cantábrica and Picos de Europa in the east. You can cut off a part of the route by starting in Arenas de Beloncio or Cuerrias.